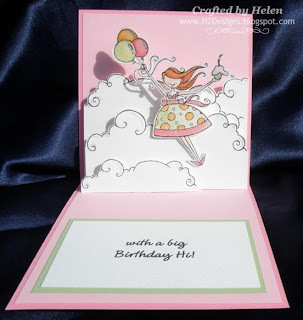 I thought I would be brave & enter her in this week's challenge at Michelle's blog. It is a colour challenge & here are the (very challenging) colours! My chosen mediums for colouring are stamp-pad inks & an aquapainter using watercolour paper. Unfortunately, try as I might, I couldn't set the printer ink (I tried a few different methods) but it kept running. Does anyone have any suggestions that they have found successful? 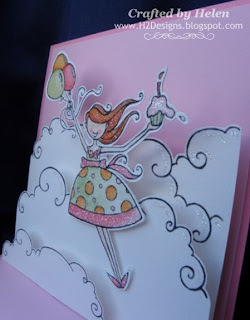 For the card I used 185gsm medium Canson watercolour paper & I heat set the ink using clear embossing powder. The ink was almost dry as it came out of the printer, so it is not a 100% set finish. I also found that the image does not look as "crisp" as it should. I chose to manipulate the image a little & made the clouds into separate items, so I could mount them as separate layers in the centre pop-up. The cardstock, DSP, ribbon & inks are all SU. 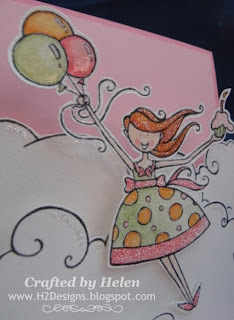 I have added sparkly glitter to balloon girl's hair, dress, shoes & cupcake frosting, & to the clouds. All the balloons have been coated in dimensional glaze to make them nice & shiny (like all good balloons should be)!